Goldbroiler is perhaps the quintessential East German dish, and one that ellicits quite a bit of nostalgia in those who grew up behind the Berlin wall. East Germans have always been pork eaters, but during communist times there were often shortages of the “other white meat,” and it was expensive. Factory chicken farming was introduced in the 1960s, and quickly became very successful. To introduce chicken into the German diet, the East German government created a chain of chicken fast food family restaurants which they named Goldbroiler The restaurants quickly spread throughout the country, appealing to families looking for an affordable treat. As far as I can tell, the Goldbroiler restaurant served roasted chicken with a paprika sour sauce, those the chicken can also be fried or stewed in the sauce. The recipe I found had me doing the latter. The name of the restaurant and dish refers to broiler chickens, not the cooking method per se. I have made many chicken stews throughout my life, but this has to be one of my favorites. It had a great, homey flavor, and the addition of the jarred peppers was genious – I liked them much better than fresh peppers. I followed the recipe pretty closely, though I didn't add the additional paprika as it wasn't in the instructions. However, I think the original recipe had it, so I've added it to this recipe for when I make it again. Also, this recipe had me mixing the flour with some milk before adding it to the pot, but in reality it made a huge mess. While this recipe has you stewing the chicken, you can just grill it or fry it after your marinate it. Do make the sauce, however, following the indicated steps, with the exception of browning and adding the chicken. 1 green apple, peeled and grated. In a large bowl, mix the chopped onion, parsley, lemon juice, 1 Tbsp oil, paprika salt and pepper. Add the chicken pieces and coat well. Cover and marinate in the refrigerator for 2 hours to overnight. Heat the oil over medium-high heat in a saute pan. Add the chicken pieces and brown on both sides. Remove chicken from the pota and set aside. Alternatively, bake, grill or fry the chicken and keep warm while making the sauce. Turn the heat down to medium low and add the sliced onion. Cook until browned. Add apple juice and turn heat to medium-high. If stewing the chicken, return it to the pot and bring to a boil. 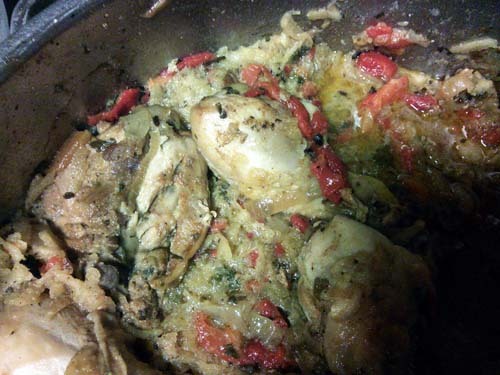 Cover, reduce heat to low and simmer until the chicken is almost done, about 30 minutes. Otherwise simmer uncovered for around 10 minutes. Add chopped peppers and continue cooking until the chicken is fully done. Meanwhile, mix the milk and vinegar and let stand for five minutes. Remove chicken from the pot and keep warm. Add the flour to the pot and mix well, until it's all dissolved. Add milk mixture to the pot and mix again. Stir in apple.